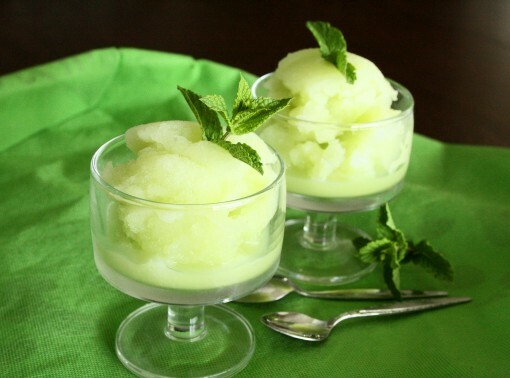 Two Ingredient Melon Sorbet was posted on September 16th, 2013 and is filed under Dairy Free, Desserts, Gluten Free, Kid Friendly, Recipes, Vegan. This entry has 14 comments. You can follow any responses through the RSS 2.0 Comment Feed. It’s easily my favourite season…and memories of hot evenings outside with friends, campfires to roast hotdogs, volleyball games, picnics, time with God on the porch, and early morning runs fill my heart with a grateful smile. While I’m a girl that easily embraces change, I must admit seeing summer end saddens me a little. However, although I’m back in the busy city with college, I’m still in summer eating mode. This means healthy ice-creams, smoothies, and icy cold desserts – pretty normal in the Colourful Palate life. I was going to sweeten this sorbet recipe up with some stevia (sweet tooth lover here), but after a taste test I realized that it was wonderful as is. I think the trick is to use a perfectly ripe melon! I loved the soft, mellow flavour of the honeydew and when made into a sorbet, it felt like a hydrating, frozen juice…a delicious, healing, vitamin C rich dessert. If you stick to one serving, it’s not too high in (natural) sugars. Serves 6. Cut the melon in slices and place in blender. Add the almond milk and blend. Place in ice-cream maker according to the manufacturer’s directions. Dish out in bowls and top with a sprig of fresh mint. Share with me some special summer memory you have? Are you a sorbet person – or maybe more of an ice-cream fan? This looks lovely and tasty! beautiful pictures! It looks to yummy. I actually love sorbet! Usually pretty healthy and vegan! That looks yummy! I have an ice cream maker and have never made sorbet. This looks so good. So simple… Even GIGI can do it! Yummy! I make one similar with frozen berries. And add a little agave to the mix. My daughter raves about it. Will need to try this one. I love melon! That looks so delicious and so easy to make! I’ve never made sorbet and will have to try this. So easy and looks amazing! Pnned and will be making! this looks fantastic!! and two ingredients?!? so easy!! Okay, I need an ice cream maker! Looks so gorgeous and how simple is that! Must try! Wow. That’s an amazingly simple recipe and sounds wonderful! I’m definitely doing this!!! YUM! That looks incredibly refreshing. I love simple recipes.